Barnet Supplier payments have been published early this month because of Christmas so we can have a festive peep at how much suppliers have been paid between April and November. So far this year Capita/Re have been paid £51.5 million in 8 months with a year end target looking like £76 million - so where are the savings? The contract for agency and interim staff (Comensura) continues to grow. In October it looked like they were getting costs under control but in November the costs were just a shade under £2 million for the month so still on course for a full year spend of £20 million. This remains nothing short of a disgrace despite all of Barnet's protestations. 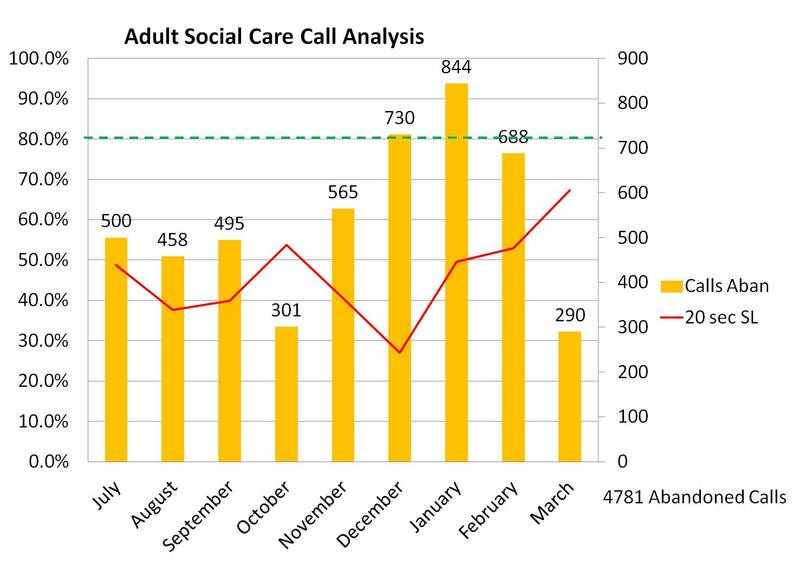 While two thirds of the agency spend is on Adults and Children's Family services, one third, or around £700,000 in just one month was spent by the Commissioning and Streetscene departments. What I can't understand is why Capita who the Council pays to run the HR department haven't got to grips with this problem and come up with some more innovative solutions to address the recruitment problems that necessitate so many interim and agency staff. 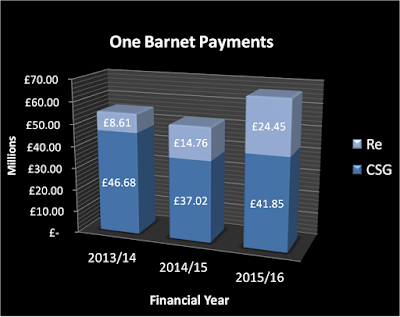 Barnet are currently undertaking a budget consultation exercise for next year's budget. Unfortunately the council want to cut key services like our libraries, meals on wheels and children's services to meet the £22.2 million budget gap next year but seem unwilling to get to grips with this interim and agency staff bill which is running out of control at £20 million a year. 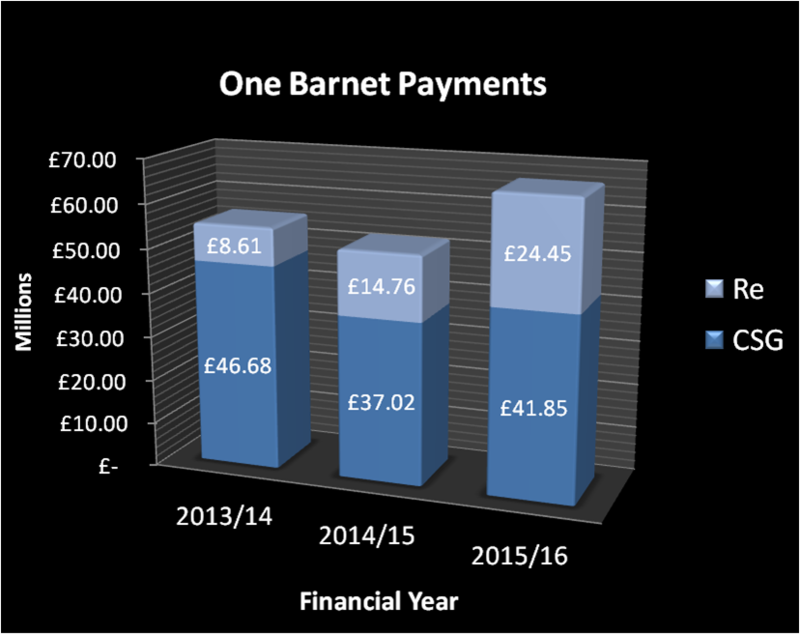 I would also say that much of this budget shortfall is of Barnet's making. They have frozen Council tax since 2010 and actually cut council tax in 2014, weeks before the election. If they had been sensible and taken modest council tax rises of 1.99% each year then we wouldn't have this shortfall. Barnet continues to be a council driven by political dogma rather than common sense and that is to everyone's regret. “I’d like to thank members of the cross-party review working group and members of the public who expressed their views. I’m pleased that, three years into the contract with Capita to supply the council’s back office and customer services, this review confirms that it has been a success. What he doesn't mention is the £25.6 million already paid to Capita for additional services outside the contract nor the £39 million they are going to pay Capita for additional services between now and 2020. That is a total of just under £65 million of additional services payments to Capita which they do not have to tender for but is automatically handed to them. I have submitted some questions to the committee which are set out below so we will have to see what responses I receive. In Appendix B it states that “Monitoring of contractual commitments forms part of the regular monitoring undertaken by the Commercial team, in conjunction with the Senior Responsible Officer (SRO) for each service. Progress is recorded in a tracker spreadsheet”. Have members of this committee received a copy of this tracker spreadsheet and can a copy be made public? In Appendix B it states that the employee survey carried out is company wide rather than on a contractual basis. Does this mean that there is no staff satisfaction survey specifically for Barnet staff and if so why has this been signed off as complete when it provides Barnet with no specific information about staff satisfaction in the Barnet contract? In Appendix B it acknowledges that the Leadership Panel is not delivered. Given that the role of the Leadership Panel was seen as a key component of the three year review why has this issue still not been addressed? 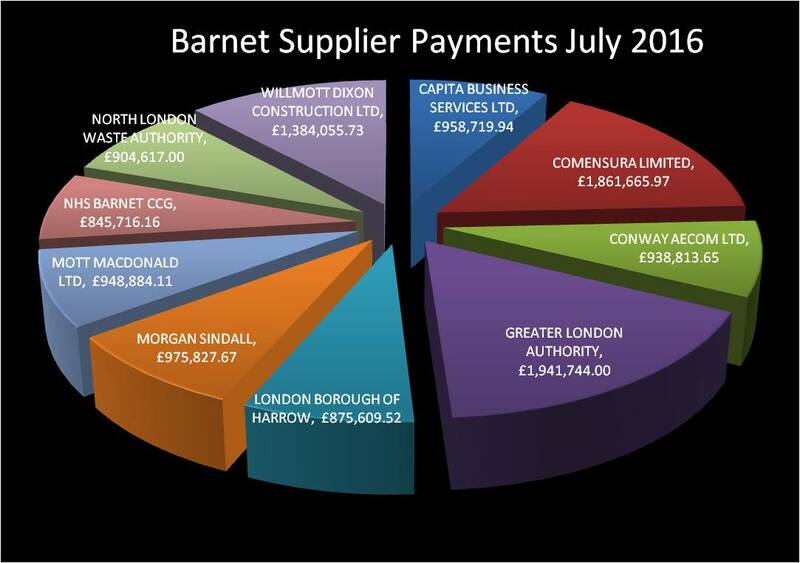 Who prepared Appendix C, a Barnet Council employee or a CSG (Capita) employee? In Appendix C what reassurance have you received that the £25.6 million that you have paid Capita for additional services represents value for money and as stated on page 7 “paying less than we would in the open market” given that all these additional service are automatically given to Capita without any market testing? What oversight is in place to ensure that the £39 million you are going to pay to Capita for additional services over the next 4 years is value for money? Why are we paying an additional £9 million on IT when IT is part of the CSG contract and that Barnet paid Capita upfront for capital investment in IT? Given that we have had 4 different IT directors in 3 years how can we be reassured that this additional spend is essential and that it will not change again when another IT director is appointed? Why are comparisons quoted as a percentage of total spend when work is volume related not cost related? On Page 6 of Appendix C what is the relevance of the capital schemes comparison? On Page 6 of Appendix C there is a comparison with £7.1 million paid to Impower/Agilisys. Given that Councillors authorised a spend of “circa £2 million” for this contract do you think this a suitable basis for comparison? On transformation project Appendix C states that contractual rate cards are 11% below the rates that would be paid to equivalent companies. What tangible evidence supports that statement? 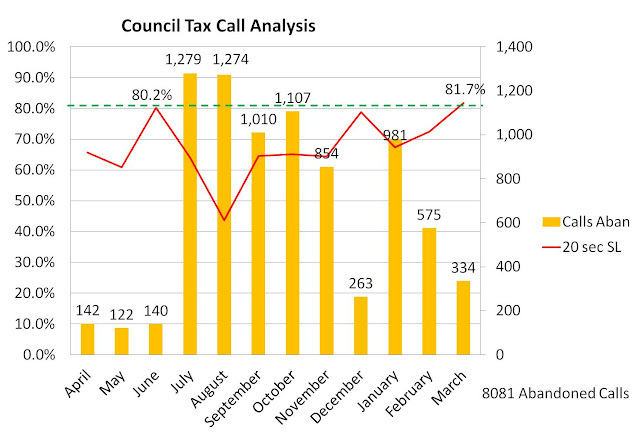 In Appendix 4 the chart showing in year council tax collection rates appears to show rates are lower in 2015/16 than they were in 2012/13. Is this correct? Supplier payments for September have just been published here. As usual the key recipients are Capita, GLA and Barnet Group. 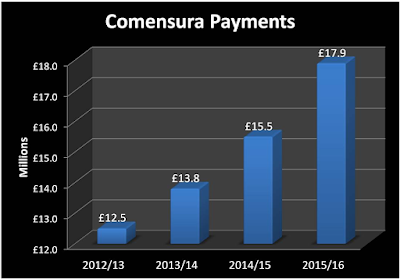 Comensura who supply agency and interim staff had a relatively modest month in August but came back with a vengeance in September with a bill of more than £2 million. That brings the total for the first 6 months of 2016/17 to just over £10 million and remains on track for hitting £20 million. 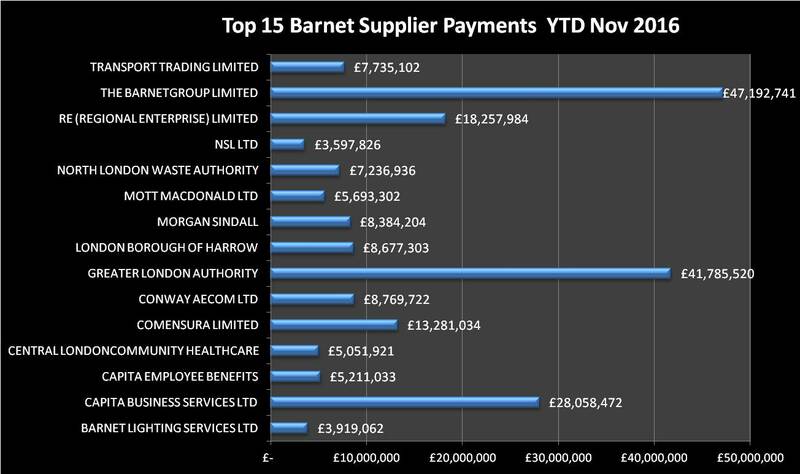 I don't know what vehicles Barnet purchased but they spent £230,503.68 with J Toomey Motors which seems rather a lot especially as they also pay Enterprise Car Hire for vehicles. We also paid HB Law £631,202.21 for legal fees and disbursements and £948,884.11 to recently outsourced education services operated by Cambridge Education. I wonder how much those outsourced services are saving? 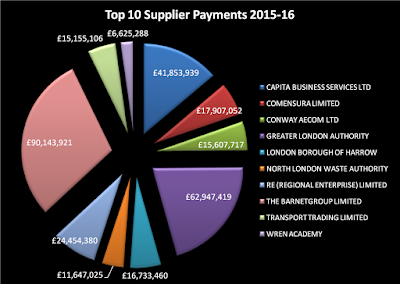 I have written a number of blogs about the amount Barnet Council spend on Agency and Interim staff as published in their monthly supplier payments. "Does it matter?" you may say. Well from my perspective yes it does. The commission payments on the agency costs are significant and numerous.We pay a commission to the originating employment agency, a commission to Comensura, one to Eastern Shires Purchasing Organisation through which the Comensura contract was let, and a gainshare payment to Capita. This year it looks like spend on agency costs will exceed £20 million. I reckon that we are paying at least 10% and probably closer to 15% (or higher), so between £2 million and £3 million in commission. 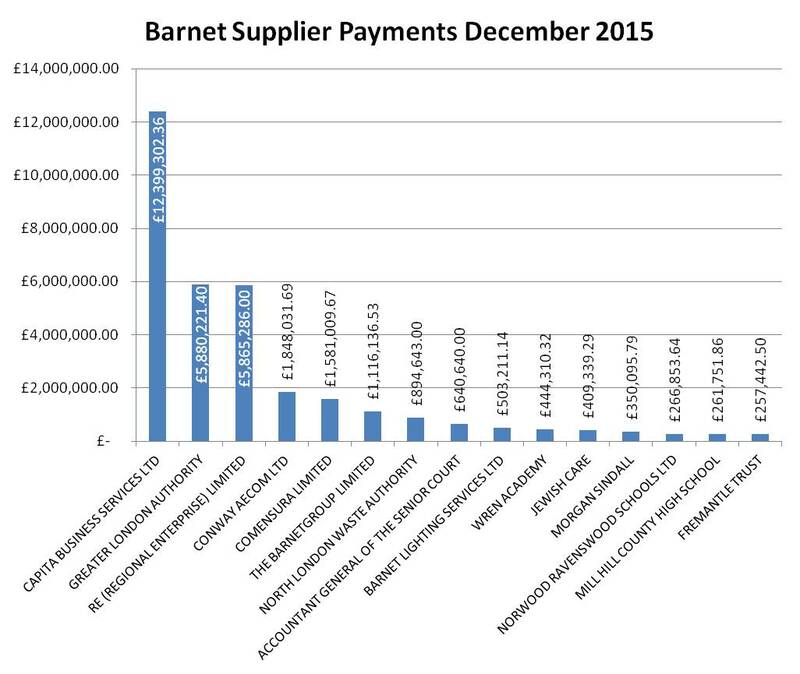 That is money that generates no benefit - simply profit for all the intermediaries between the member of staff and Barnet Council. In addition, there are a significant number of interim and agency staff who are paid at consultancy day rates significantly above the typical salary for that post. Lastly, there is the cost of having to go through a series of different people each time the interim moves on, something which I raised at the Performance and Contract management evidence session and something which even Conservative councillors agreed was a problem. So why raise this again now? Well this week 46% of Barnet's librarians have been told they are being made redundant to save around £2.5 million, a sum very similar to the commission being paid on agency staff. 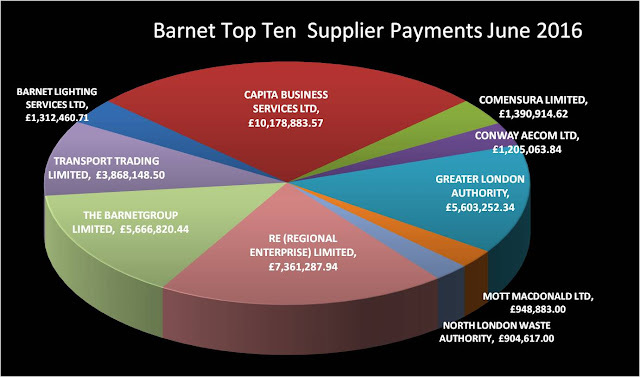 This demonstrates to me that Barnet Council have completely lost the plot when it comes to setting spending priorities. In the past I have been told that the reason for the increasing agency spend is because of the inability to recruit social workers. While that may be part of the problem, scrutiny of the evidence suggests that use of agency staff is endemic across several departments. 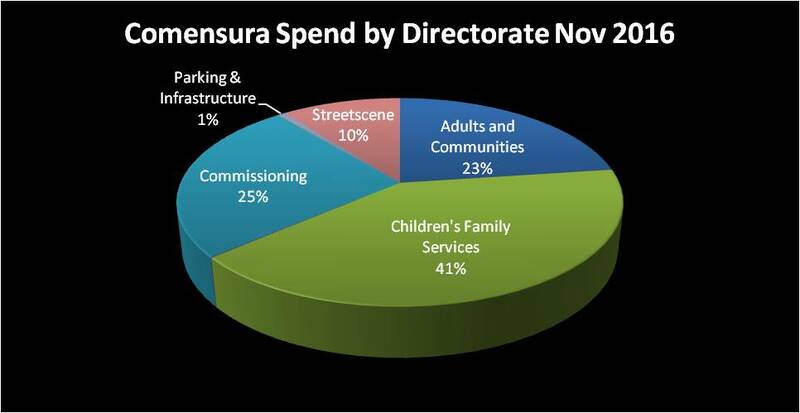 In the latest detailed analysis of the Comensura spend in July 2016 £419,000 was spent on agency and interim staff in the Commissioning department and £227,000 was in Streetscene. 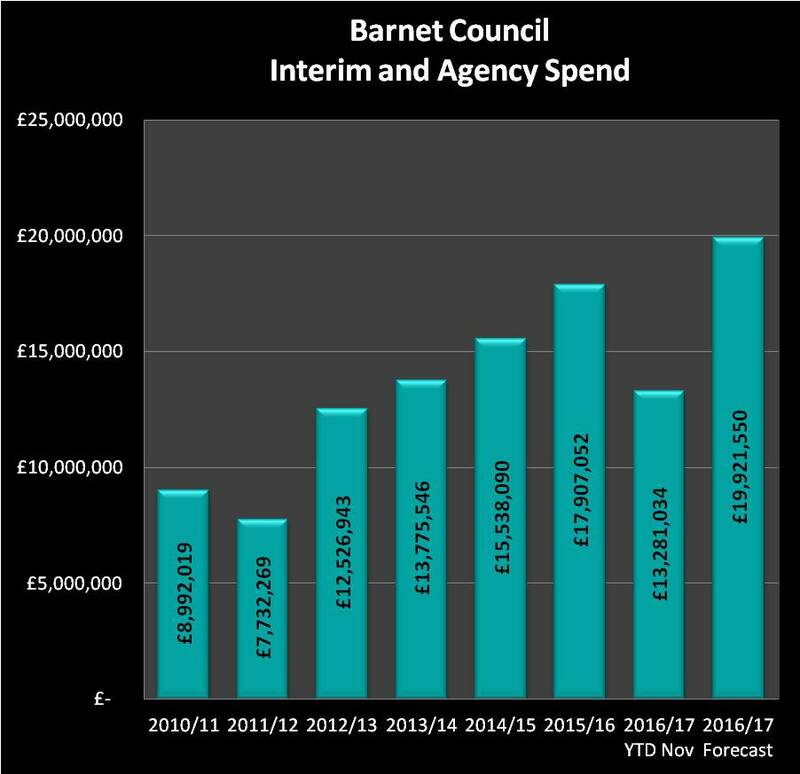 The graph on the right illustrates just how much agency and interim spend has grown since the concept of One Barnet was dreamed up. The spend doubled between 2010/11 and 2015/16 and is set to grow further this financial year at a time when more and more staff are being made redundant and that just doesn't make economic sense. Barnet's July supplier payments have been published here and it is generally a light month with total spending at just £29.9 million. 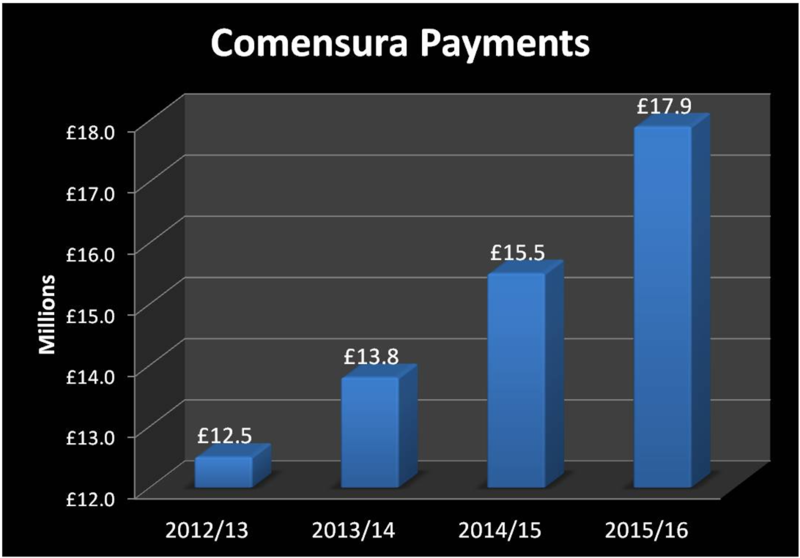 The one payment that does jump out is Comensura who supply the council with agency and interim staff. In July they were paid £1.86 million and this brings the total for the first four months of this financial year to £6.9 million. 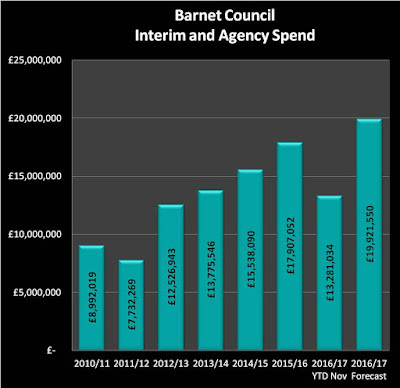 On that basis it looks like Barnet will hit £20 million for spend on interims and agency staff this financial year. This is completely unacceptable given that we are paying commission and agency fees on all of those payments. If we are paying 10% commission on this agency spend - and I suspect it is significantly higher - then the commission alone is is almost as much as the Council are planning to save by destroying our library service. Not only that but the lack of continuity by employing an never ending stream of interims and agency staff leads to inefficiencies and the same mistakes being repeated time and again. I have questioned Conservative councillors about this on numerous occasions and they entirely complacent on the matter. Having outsourced so many services it seems ridiculous that so much is being spent on temporary staff. Richard Cornelius is the leader of the council and the buck stops with him. He has to get a grip on this massive problem. As a Remainer I was desperately disappointed at the Brexit vote, but we are where we are and we have to get on with it. However, the issue that strikes me most now is how Labour have failed to address the issues that clearly resulted in so many Labour supporters outside London voting for Brexit and how there seems to be no clear strategy for moving forward. In the run up to the referendum, the debate was entirely sterile, arguing around tightly defined topics with no real thought about how to plan for a new model that would provide an engaging vision of the future Britain within the EU. If I start with immigration, part of the issue, as I see it, is the large number manual unskilled and semi skilled jobs that have attracted so many EU migrants. The root of this problem, from my perspective, is the failure of the UK education system to train up the UK workforce appropriately and the consistent failure of UK Governments to develop an industrial strategy that encourages the growth of skilled and semi skilled employment. The Work Foundation generates some fascinating statistics about both employment and under employment and the skill levels of our workforce. The push for growth in the University sector http://www.theworkfoundation.com/blog/2580/The-future-of-work-is-a-degree suggests that by 2024 there will be 5 million more people with higher education qualifications yet only 2 million growth high skilled jobs. At the same time there are no signs of any growth in those people holding NVQ3 qualifications. According to the Chartered Institute of Personnel and Development in 2014, 58.8% of graduates had jobs which did not require a degree. It strike me that some of these semi skilled and trades jobs are being filled by EU migrants simply because we haven’t trained enough UK staff with the correct skills to fill them. We have created the vacuum which EU migrants have filled. That is not their fault - they are fulfilling a need. To my mind you can look at the situation we are in in two ways; welcome EU migrants and let the underskilled and underemployed continue to resent our EU and see vindication in the Brexit vote or set out a much more comprehensive plan to reskill our national workforce giving them a better chance to compete for those semi skilled and skilled jobs, something that will be essential if we opt for the "Norwegian" option/EEA membership which will still require free movement of labour. In January this year Sir Michael Wilshaw roundly condemned the Further Education sector http://feweek.co.uk/2016/01/22/leaders-rush-to-defend-fe-from-sir-michael/ yet it is clear that government funding to this sector has been cut repeatedly, creating and perpetuating the shortcomings of the FE sector http://www.theguardian.com/education/2015/nov/24/further-education-cuts-colleges-spending-review An example of this is the skills shortage in the construction sector. Indeed back in January https://www.theguardian.com/business/2016/jan/14/uk-housebuilding-held-up-lack-bricklayers-report-rics David Thomas of Barratt Developments described the skills shortage as “the number one challenge for housebuilders”. With a strong, vibrant FE sector producing skills workers for sectors that need them we could be filling that vacuum not making it worse. I was discussing this with my sister, a retired teacher. Before retiring she was responsible for for NVQ courses at her secondary school. At its peak they were running 23 separate NVQ courses giving children recognised and desirable qualifications and a direct gateway into good quality jobs. Change of government, change of policy and those courses disappeared denying many children an opportunity to succeed, an opportunity to enter a career path, an opportunity to earn and contribute to society. The table below summarises the main findings. That suggests there is still a lot of slack in the economy. Short term underemployment has become entrenched as long term underemployment because the government has failed to address and allowed employers to exploit it with zero hours contracts. It may give employers some flexibility but it is a devastating waste of resources, especially young people who could be contributing so much more to the economy and reduce the burden on the social security budget. To my mind we should be stimulating the economy to take up that slack, to take people out of low pay and benefits and to give them spending power that will in turn help stimulate growth. But this takes us to the second area where politicians have failed. From a personal perspective, at a very micro level, I was pitching for a contract in Australia. To get round the red tape necessary to compete in the Australian market I rang up the UKTI team, a Government department to help exporters, and asked if they could help answer a fewer questions relating to employment and contract legislation. Having been put through to the Australia desk I was told they only supported defense contract bids. So no help there. As it turned out I won the tender but with no help whatsoever from this government. Maybe I was just unlucky but I suspect that departmental cutbacks and a lack of clear strategy were contributing factors to the lack of support. The Tories have demonstrated over the last 6 years that they have no ability to deliver a new vision for Britain, just short term gimmicks and knee jerk reactions that have culminated in this disastrous situation we are now faced with. The Tory party are at war with themselves and that is all they are focused on at the minute.I have no belief that they will ever take a long term view about our economy and our role in th world market. It is all about short term tactics and point scoring off one another. However, seem no better. If all those Labour MP’s were to stop messing about calling for votes of no confidence in Corbyn and actually come up with a clear plan of what Britain could look like, how we could rebalance the economy and generate well paid skilled jobs for well trained UK residents, then the issue of migration, and our lack of confidence in the EU would drop away much as it did in the early 2000's when the economy was storming along, would become much less of an issue. Indeed, they might actually start to win over a much greater majority of the electorate. Ignoring what 17 million people have said is pointless because it means you will never get re-elected. What we need are solutions that address those concerns but in a constructive and positive manner that benefits everyone not in-fighting that benefits no one. Bill Clinton coined the phase, "It's the economy stupid" and that holds good today as it ever did. The Brexit vote has just made that more difficult but now more than ever Labour has to come up with a strong and credible industrial and employment strategy that will help get people back into good quality well paid jobs. Please can you clarify how the reduction in Single Person Discount is calculated to arrive at the net figure and, for example, is a saving made in 2015/16 treated as an on-going saving for the purposes of gainshare calculation or just a one off saving for that year only. Please can you clarify how the Additional Council Tax Income is calculated to arrive at the net figure. 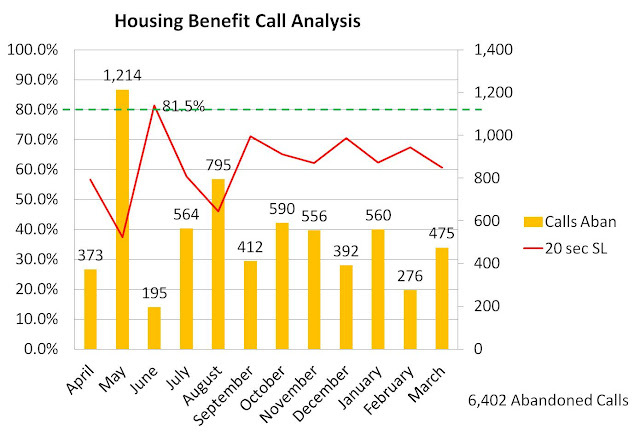 To what extent is the additional income from the additional 2,732 households treated as part of the calculation and why is 100% of the net income paid to Capita in Gainshare. Can you clarify if Capita have achieved the 98.5% council tax collection rate and how that impacted on the Gainshare payment. Why did you set a guarantee target in 2015/16 that is £3.3 million lower than for 2014/15 when recurring savings on renegotiated contract continue to attract gainshare payments for Capita? 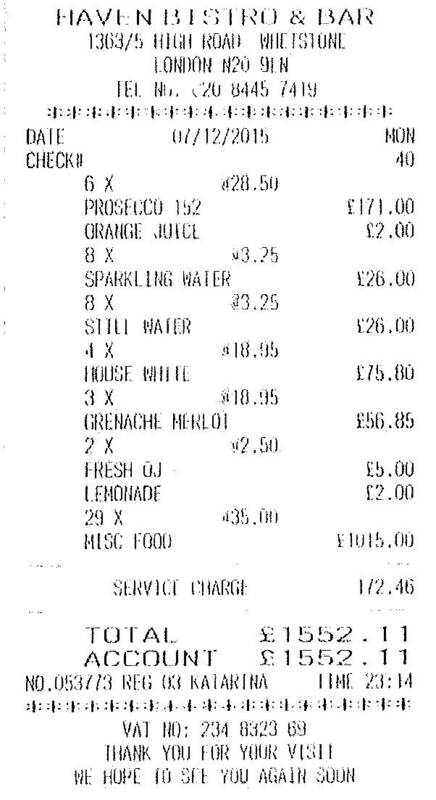 Please could you clarify of what the £242,615.87 true up payment comprises? Who authorised the spend of £276,094 for an accelerated refresh of employee computing devices so all devices are refreshed after 18 months instead of 5 years. Was the procurement handled by Capita and did they generate a gainshare saving on this purchase? Please can you clarify what the £9.7 million contract true up of third party contracts comprises? For the library service call cost of £453,000 what does that work out per call? a) There is a lack of formal documentation held by the Council of the first line defence activities operating at Capita. For example, this may include access to procedure manuals to assess whether the control framework in place mitigates the Council’s key risks. This was highlighted as a finding in relation to the accounts payable process where there was no up to date procedure document in place. b) That currently Internal and External Audit activities provide the only evaluation of the design and operation of the controls in place within Capita processes to mitigate the Council’s key risks... These form part of the third line of defence in the assurance framework. This testing approach is generally retrospective and would only identify issues after they have occurred, possibly a significant period of time following the initial non-compliance. We did not see evidence of real time monitoring of the operation of Capita controls. c) Although some second line management oversight activities were found to be operating effectively, there are some second line activities which are currently recorded as the ‘first line’ of activities within the Commercial team’s analysis. These should be moved within the updated version of the assurance map. On that basis are you sure that the clienting arrangements are satisfactory? Do you think it is appropriate for Council Senior Responsible Officers to be commissioned to assess delivery of the contract against outcome specifications, method statements and contractual commitments given that they are fulfilling this role already. While it will undoubtedly be useful to take their evidence surely it would be more appropriate for someone independent such as internal audit or an external body to make that assessment of delivery? Please can you clarify the contents of the benchmarking survey and can you confirm that it will also include examples from private sector partnerships? Will any members’ working group meetings be open to the public? When will the public engagement take place and what steps are you going to take to ensure that the public are actively involved in the process? Who will be responsible for reconciling whether the commitments set out in Schedule 35 of the contract have been delivered? What contingency plans have been made to consider terminating part or all of the contract if the 3 year review is unsuccessful and agreement on changes cannot be reached? When will you be taking evidence from the Leadership Panel? Will you be publishing Capita’s proposals of new opportunities for improving service quality and reducing costs throughout the Contract Period? I will update you after I receive answers to my questions. £173.3 million paid to Capita - so where are the savings? The March supplier payments have just been published and we now have a clear picture of payments for the whole financial year to Capita. Between the two contracts, CSG and Re, Capita have received a total of £66.3 million. 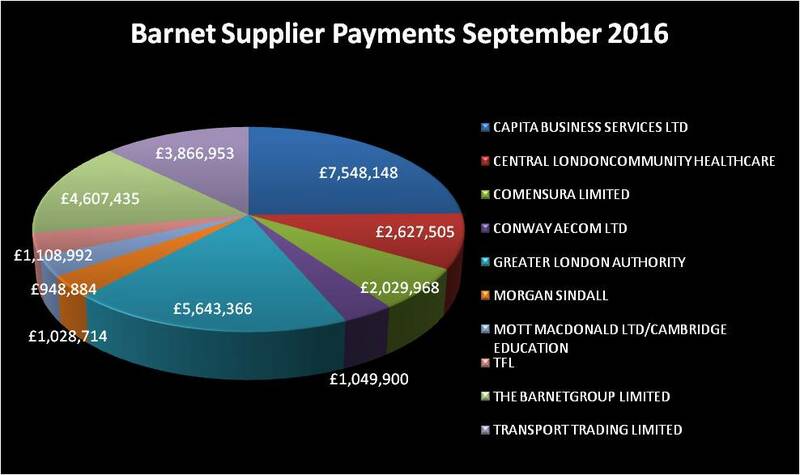 That is up £14.5 million on last year's payments, a 28% increase. The budgeted cost was £41.7 million so the extra £24.6 million is for other payments including special projects and gainshare. At a recent committee meeting it was conceded that on some of the Special Projects we are paying consultancy rates for work that would have previously been done by salaried council staff. The core contract is cheaper but we pay for everything over and above that contract and that is where Capita make their money. One of the other massive overspends is on the interim and agency staff contract with Comensura. Back in 2012 the contract was costing us £12.5 million but it was at a time when the council was in the midst of the outsourcing process and staff were leaving to avoid being made redundant. With the appointment of Capita it was anticipated that the agency staff costs would fall but in reality they have done the opposite. This financial year they have hit an all time high of £17.9 million. Last year I said this was a contract out of control and sadly that has proved the case. To make matters worse Comensura is on of the contracts on which Capita are paid gainshare. 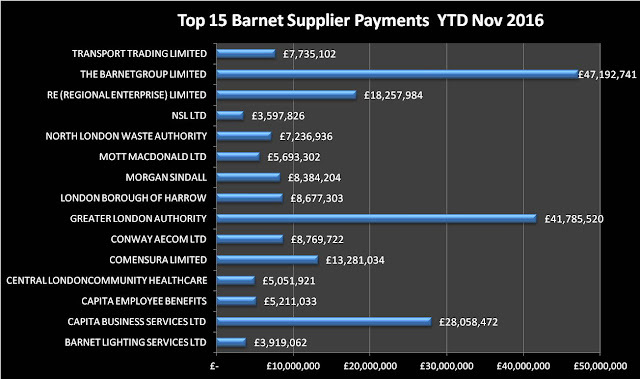 They are supposedly saving us money for which Barnet pays them a hefty share, now in excess of £1 million. 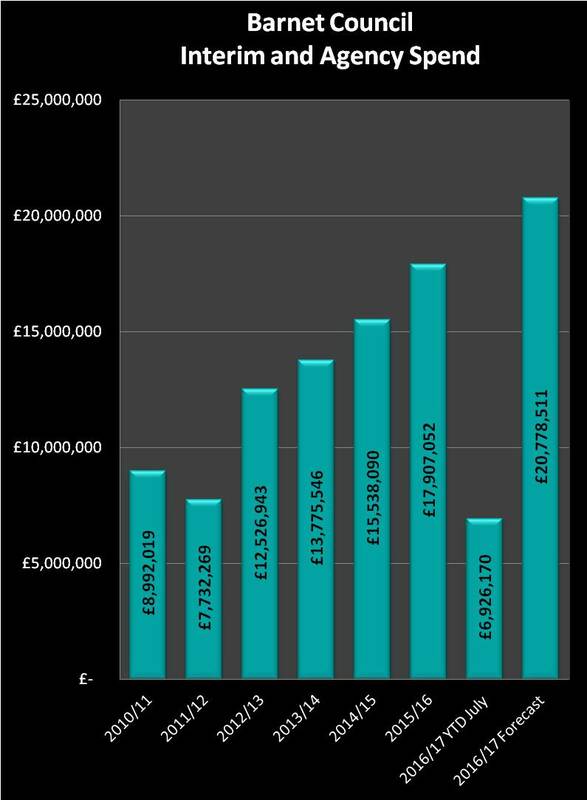 In total, since the start of the Capita contracts in 2013, they have been paid a total of £173,384,365.48 Yes £173 million in just two and a half years. Yet again, I repeat my challenge to Richard Cornelius in that I will pay £250 to the charity of his choice if he can show me how this contract with Capita is saving us money. I am sure everyone is now aware that East Barnet is one of the four libraries that has been designated a Partnership library. This means that it will be run by volunteers with a target of opening just 15 hours a week. I was there last Saturday afternoon and it looked like Barnet had already abandoned the library. Of the six computers on the ground floor, four were out of order. Two are in the children's area and two of the four adult computers. The children's computers are of course turned off because of the IT failure as there is still no filter system in place - the system isn't fixed no matter how often Conservative Councillors say it is. The other two computers had been out of action for three weeks but because of the much bigger IT failure, they had been given a low priority for repair. Several people tried to use the automated issuing machines but couldn't because of course the IT system isn't fixed and librarians were having to deal with individuals to check their membership records and update the system with data that has been lost. Roll forward a week and today I have just paid another visit to the library. The four computers that were out of order last week are still out of order - the filter system on the children's computer still isn't working SEVEN WEEKS after the IT failure. What I also noticed was how empty the shelves are looking; many had bookends to hold half a shelf of books together, other shelves were completely empty. It just feels like Barnet have walked away. I always used to go to the stand where the new library books are displayed but it was very sparsely arranged. As I understand the situation, because of the massive exercise to repopulate the database with all the existing stock they have stopped or slowed down new book purchases. Either that, or as is looking increasingly obvious, Barnet council have made a clear decision to stop investing in East Barnet Library now it is going to be transferred to another organisation, whoever that may be. Talking to someone last night they were saying not as many people use East Barnet library these days but frankly I'm not surprised if it is being run into the ground. Exactly the same thing happened before the Capita contract was let - the existing service was allowed to collapse so that Capita could come in and tell everyone what a wonderful job they have done to improve the service. But what a great resource the library is for the local community. People reading newspapers, children reading books, people using the working computers, people borrowing books. As a small business owner I can't afford, nor have the space for, an A3 colour photocopier. But there is one at East Barnet Library which I often pop in to use. Some Conservative Councillors measure a library's success simply by the number of books they lend but libraries are so much more than this. What also upsets me is the lack of a visionary strategy for Barnet Council which could have seen libraries become community offices of the council. Barnet have commenced work on building a new 90,000 sqft council office in Colindale at a cost of £34 million. The parking will be very limited not just for the staff but for visitors to the offices so getting from East Barnet to Colindale will be a real problem. The library strategy identified 47,000 sqft of "spare" space across all 14 libraries, more than half of the total space being built at Colindale. Why couldn't the council have embraced a localised strategy with as many customer facing services co-located in libraries as possible and with a much smaller core service in the main building. Big savings on construction, less issues with parking as staff could park at the libraries, services accessible to local people in their local community. Decent technology means that staff can work in dispersed locations comparatively easily and it certainly would exemplify the council's "single point of contact" strategy but in person rather than on an automated telephone system. Saving money on libraries only to spend it on new council offices is not what I, nor I suspect what most people, voted for. But then again when has this council worried about what local people think. Back in 2012 I remember attending a critical meeting in the run up to the decision to award the CSG contract to Capita. What was so memorable was how Cllr Hugh Rayner actually vocalised what everyone was thinking - when you have a contract how do you avoid being ripped off by the supplier with contract variations. "I let out contracts myself to various customers and what I learnt in the contract is the word change or variance, because I know they are tied into me for the contract and this where I make all my profit and make up for the low price at the beginning"
A response was given saying we have to be robust.... blah blah blah, yet everyone at the time knew that this is exactly what was going to happen. Since the start of the contract there have been a number of variations but buried in the papers of the latest Performance and Contract Monitoring committee there is a schedule of the contract variations to date. The report notes that nine contract variations were approved during the quarter. 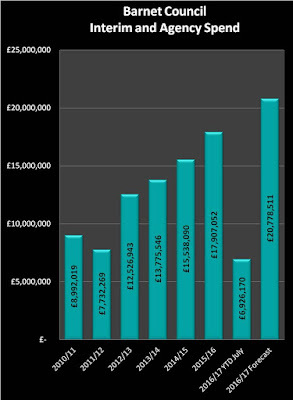 Six have a financial impact accounting for an increased cost of £1,933,025. Well that's fine you may say they are making savings as well but actually some of these are savings linked to fewer staff having to be made redundant at the time of handover because so many had already left the council and from reduced pension contributions. Indeed the largest offset was an amendment to schedule 1 and 4 to reflect the return of the Repairs and Maintenance budget for the Civic Estate to the Council in line with all other managed budgets which amounted to £6.5 million. You may recall but back in 2014 I drew attention to one such contract variation to do with calls for libraries being directed to the Coventry call centre instead of direct to the libraries at a cost of £453,000 for the first two years of the contract. I estimated that this worked out at just over £8 per call which seems pretty expensive to me especially as so many of the calls were unresolved. The rights and wrong of the various contract amendments is almost irrelevant. The key issue is that this contract is proving more expensive than originally envisaged because of contract variations and that extra money we now have to pay could have funded other services such as the meals on wheels or reduced the cuts to the library service. As I keep saying "Show me the savings"
Mr Reasonable was sent this information from a concerned resident in Barnet who feels that the Parks and Open Spaces consultation is a sham. Having heard about their experience I can only agree. I attended the Finchley & Golders Green residents' forum and picked up a leaflet "Your environment, your views" which is about the Consultation on our parks and open spaces. At the bottom of this leaflet it has "For a paper copy of the questionnaire, please call 020 8359 4642". I phoned the above number. The person who answered said they were Regeneration. I checked that I had phoned the above number (it is displayed on my phone and I had) and also told him what number I had phoned. My understanding is that this number has been automatically redirected. He said it was nothing to do with them and I was put back to the switchboard who then put me through to Street Scene. The woman who answered knew nothing about the consultation and kept asking me if it was a survey, to which I replied it was not, but a consultation. She said it was all dealt with by the "back office" and when I kept asking where the "back office" was she said at NLBP. I asked if there was somewhere in Barnet or Finchley I could pick up a copy. I was put on hold and when she returned she said I could send an email to parks@barnet.gov.uk. I said that would require a computer - what about the people who do not have access to a computer to which there was no acceptable reply. She then asked if there was anything else she could help me with! She said I would be automatically directed to a satisfaction survey (I think that was what it was) but the phone just continued going 'beep, beep, beep,....(was that because I was obviously not satisfied?) All this took 19 min 34 sec with no chance of my getting a paper copy of the consultation. I find the on-line questionnaire procedure very negative. Before I begin to fill in a questionnaire I like to know what all the questions are but with the on-line questionnaire this is not possible as you cannot move to the next screen until information is put into the required fields. Additionally, in many cases the information put into each individual field cannot be displayed on the screen at the same time because only about 2 1/2 lines are and you have to use the scroll bar to see other lines but again only about 2 1/2 lines at a time . Also I would like my own copy of my responses. Additionally, I would like to be able to review the completed questionnaire with my responses so I can amend them before I submit it but Barnet Council questionnaires do not have this facility. Is it too much to expect that the phone number I rang from the flyer would have someone who could have taken my address and posted a paper copy of the questionnaire to me - taking about 2 minutes of mine and their time? Why is there not an option to download a copy of the paper questionnaire so people could then either write in their replies and post it back or be able to draft their replies and then input them into the on-line questionnaire. I believe this should be available for all consultations and would require little effort by the "back office". (There could be two options - one environmentally friendly / screen user friendly option listing all the questions with no spaces for replies and another with blank spaces for replies) Even this option would make this questionnaire available to more residents. There might be some in a household who are okay to use a computer and do the on-line survey and others who are not and having someone else print a paper copy for them would allow them to complete the consultation too. If they do not have their own computer, it should be possible to go to their local library, if they continue to exist, and have a librarian print one off for them. I like to have time to think about my responses and perhaps amend them later. This is not the same as saving part of the on-line questionnaire for later as you cannot even use 'Print Screen' to get a printout because of only 2 1/2 lines displayed in many instances - the easiest way is to copy and paste each reply into a word file, print it out with blank spaces so you can write the questions in later or if there is lots of info to copy and paste these too. Hence my much greater preference for a paper copy than the present on-line survey. Is it possible to reply to a consultation by writing a letter or an email? I have wondered if this is okay or not but cannot find any information one way or the other. Sometimes there are other things that you want to add that do not come under any of the questions but would be under the umbrella of the consultation. Or you just want to write prose and not be restricted by questions requiring certain responses. If this is also an option it should be clearly stated on the consultation web page - if it is not, it should clearly state that only on-line questionnaire responses will be accepted..
On the council website under the agenda for the Finchley & Golders Green Residents Forum there is Appendix 1 - Draft Parks and Open Spaces Consultation (link below). Any councillors who have read this will be under the impression that the consultation is more readily available than it actually is. I note that this is also an appendix to the Hendon Residents' Forum but not the Chipping Barnet forum in January. On 22nd Jan I went to North Finchley Library and asked for a copy but they knew nothing about it. I was able to direct them to the engage Barnet website so they could see what I was asking about but there was nothing on there about copies being available from the library. This consultation is about parks and open spaces. Many people who use parks and open spaces would have no idea that this consultation is running. A couple of months ago the laminated notices "Your Park - Keep It Green" with a photo of volunteers working in a park settling was placed at most of the entrances to my local park, Victoria Park. Why has something similar not been placed at the park's entrances regarding this consultation? We all know that these consultations are just window dressing - Barnet Council will sell them or use them for other uses than a park or open space. But if more people know about and have greater access to the consultation there will be a greater response. As I mentioned in my previous blog there was a payment of £1,552.11 in the December supplier payments which was for "Equipment and Material Purchases" by the Assurance Department. Yesterday I received the response to my FOI request to understand what this payment was for. It turns out this was for a Town Twinning Dinner at Haven Bar & Bistro, Whetstone with a delegation from the Council’s Twin Town of Morphou, Cyprus. Expenditure was from the Town Twinning Budget and payment was authorised by the Mayor’s Secretary. This dinner formed part of a schedule of events with the Morphou Delegation. My main concern is that it was labelled as ''Equipment and Material Purchases" as I think that is misleading to say the least but the question does arise should we have spent this money at all. Some may say it is a relatively trifling amount and is something we should do to maintain friendships with Morphou. Others might say that at a time when we are cutting meals on wheels adult social care and children's services this is a rather inappropriate payment and maybe it should be sponsored by a local company or supplier to the council.